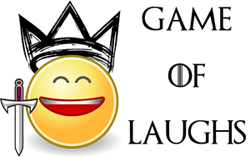 Game of Laughs: George RR Martin responds to the controversial "Black Wedding"
George RR Martin responds to the controversial "Black Wedding"
There have been differences between the novels and the television show since the first episode of season one. And for just as long, I have been talking about the butterfly effect. Small changes lead to larger changes lead to huge changes. HBO is more than forty hours into the impossible and demanding task of adapting my lengthy (extremely) and complex (exceedingly) novels, with their layers of plots and subplots, their twists and contradictions and unreliable narrators, viewpoint shifts and ambiguities, and a cast of characters in the hundreds. There has seldom been any TV series as faithful to its source material, by and large (if you doubt that, talk to the Harry Dresden fans, or readers of the Sookie Stackhouse novels, or the fans of the original WALKING DEAD comic books)… but the longer the show goes on, the bigger the butterflies become. And now we have reached the point where the beat of butterfly wings is stirring up storms, like the one presently engulfing my email. Prose and television have different strengths, different weaknesses, different requirements. David and Dan and Bryan and HBO are trying to make the best television series that they can. And over here I am trying to write the best novels that I can. What is your reaction about the scene? Were you shocked after watching it or were you expecting something like this happening, considering how dangerous the Boltons are?